The 2018 NASCAR Camping World Truck Series season is now four days over, and observers all agree that it was an ideal year for the sport’s number three division. No incessant talks of Cup drivers ruining the show, no extra nonsense with behind the scenes matters, and a series regular earned the title with an underdog team as Brett Moffitt used six season wins to score a championship. The 2018 season was by the regulars, for the regulars, and not an ounce of hubris was in sight. Not only was there a strong storyline in Moffitt’s championship run, other drivers had their time in the sun. Justin Haley surprised many when he went from winner at Gateway and MoSport to championship threat with his Texas win in November. Johnny Sauter continued to be the best in the division with six wins. 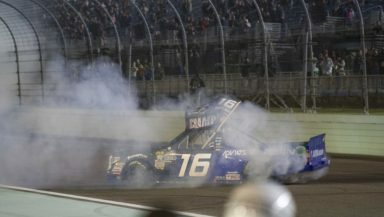 Noah Gragson was always at the front in his Kyle Busch Motorsports Tundra while teammate Todd Gilliland contended for wins throughout the season. Even ThorSport driver Grant Enfinger put up some strong numbers, even scoring a win at Las Vegas in the Playoffs. The 2018 Truck Series season was host to some of the best racing in NASCAR during the year, which lives up to the division’s reputation as a haven for good racing. That had been a difficult claim to boast in previous seasons as part-time dominance wrecked winning hopes for series regulars. Instead, in 2018 non-series regulars won five races, as Kyle Busch won two and John Hunter Nemechek, Chase Briscoe, and Timothy Peters all won once. That left the season to be decided by who mattered the most–division regulars. 2018 was the season the Truck Series earned it’s identity back after years of just being viewed as a lesser division, a feeder/development series. Quite the opposite is true; any racing division should be recognized not as a feeder series but as it’s very own product. The Truck Series has been in this position before, producing some of the best product in NASCAR and standing on the strength of its own quality product. The division isn’t out of the woods yet as several teams face the very real issue of finances. Season champion Moffitt and his Hattori Racing Enterprises are unsure they’ll be paired up next season despite this season’s successes. This is an ongoing problem across the board with successful drivers still going without rides as they’re not bringing in enough funding. But if the Truck Series can have another season like 2018, and if drivers like Moffitt can secure funding for another championship run, the division might not become an equal to the Cup series, but it can come close.